So Corbyn bottled it. All the desperate spin and plaintive self-justification by his acolytes cannot obscure this simple truth. Their arguments are spurious and mendacious. At best. Even if the alleged strategy – to avoid a split in the party – had been successful then the unity of the Labour Party has been prioritised over saving the lives of Syrian infants. But, to pile tragedy upon contempt, the strategy has not and will not be successful. Corbyn has been hounded and monstered from day one. At least half the shadow Cabinet and a majority of the Parliamentary Labour Party have been in open revolt from the very moment he ascended to the leadership. Their contempt for him has been astonishing. Their disobedience, their disloyalty and the disdain in which they hold their leader has been there for all to see. There is no unity. None. Instead, there is – cruel pun, perhaps – a civil war raging inside the PLP. It cannot be avoided. It’s happening now. To continue the martial metaphors, it is a universal truth of military warfare that if one must fight a war, then one should always seek to do so on terrain of ones own choosing. Corbyn should have taken the fight to his enemies. He should have whipped his MPs and sacked the pro-war dissenters. He has the overwhelming support of the membership and even official Conference policy on his side. Yes, the split would have widened but it’s here already and is set only to accelerate anyway with, possibly, Corbyn ousted from his post. And such an act would have been in the service of nothing less than humanity and he, at least, would have acted with courage and principle. As it is, he has chosen the coward’s exit; the Pontius Pilate option of washing his hands and preserving his own sainted purity while allowing his MPs a free vote to massacre brown babies. His supporters mutter darkly about deselecting the pro-war MPs in their constituencies; allowing the rank-and-fail to dole out the punishment they so richly deserve but that Corbyn lacks the guts to deliver himself. This, though, is a ridiculous double-standard. Corbyn apologists defend the free vote as ‘a matter of conscience.’ Yet now they wish to punish MPs for… voting with their consciences? (or at least that which passes for conscience among these people) So a free vote is fine for Corbyn but not those who disagree with him? In fact, the sixty-six MPs who voted for war can’t even be termed rebels. After all, what were they rebelling against? There was no party line. Such is the unavoidable outcome, the inevitable logic, of Corbyn’s tactical cowardice. And what of those MPs? On the one hand there are those who genuinely believe that murdering Syrian civilians in an utterly futile and doomed attempt to bomb an ideology into submission is the right thing to do. It says so much of Labour, ‘a party fit for imperialism,’ that these worthies are the good guys. Relatively speaking. At least such people have the dubious honour of being up-front and honest in their idiocy and callousness. Worse, though, than even these creatures are those Labour MPs cynically exploiting the impending massacre for personal career advantage; and to settle scores with the leader they despise. Terrified of the growing wrath of their local party members and the prospect of losing the perks and trappings of Westminster, they plot, they scheme and they betray in a concerted bid to bring down Corbyn to save their own careers. Imagine that; pursuing the killing of other human beings solely to shore-up your ambition. In both cases, these specimens have lined up with the Tories and condemned Syrians to death. And so it is that another murderous folly is now unleashed. The UK’s fourth in fewer than twenty years. Once more unto the breach, dear friends, once more; close the wall up with Muslim dead. Nice article Harry, I found a link on The Canary. You seem to be a man with similar thoughts to my own! I will definitely keep an eye on your work. I recently started a blog myself, and would love for you to stop by and have a look, it’s at http://macs-mouth.blogspot.co.uk. As for your thoughts on this matter, I’m torn… I do think you’re right and J.C is allowing far too many forces to align against him, but I also think if he’d adopted the whip like you suggest, the Tories and Right wing press would have torn him to ribbons. Literally shredded him. Yes of course that’s what the Tories do all the time, but that doesn’t matter. It could well have been the ammunition to destroy him completely. If Corbyn cracked the whip, it would have caused a leadership contest and with Chuka Umunna getting himself a beard, he would have been balls deep with Hilary. I also regret giving my vote to that fat f**k Watson. Corbyn’s playing the long game but in this age of idiots, the twitter feed is king. Food for thought, JS. Thanks for stopping by and contributing. Appreciated. 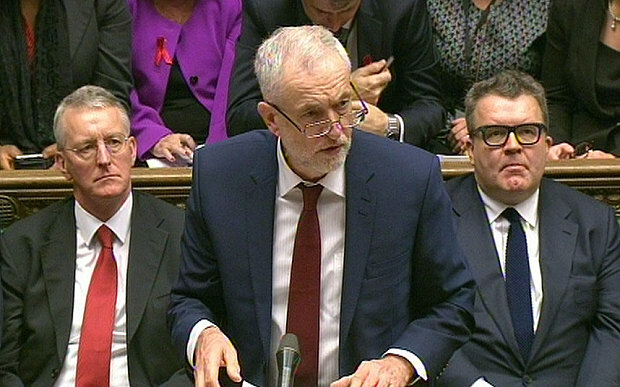 Corbyn attacked by right and left. Same plight of Richardson in your excellent book on the miners’ strike. A whip would not have changed the numbers in my opinion, a free vote was probably more effective in gaining favour for opposing strikes, especially when coupled with survey of membership and open letter from Corbyn making his position clear. He received immense criticisms for it, in the right and left. I think it was the best he could do with the current situation- the numbers were always against him- so, he vocally opposed the strikes, showed MP’s were going against the wishes of majority of members and pressed for MP’s to do likewise. They are looking for ways to supplant him, no doubt. It’s relentless. Pretty standard demonisation, ridicule, slurs, ‘terrorist sympathisers’ is akin to enemy within type stuff. The numbers wouldn’t have changed, Chris, no; you’re correct. My point is that it is long overdue he cracks down on the outrageous behaviour of the right-wingers and stamped his authority on the PLP. And when better to do so than, literally, a matter of life or death? Labour ‘a party fit for imperialism’ can be purchased here!